Four things I discovered about trying to read a graphic novel on a kindle. There are only 17 free graphic novels for the Kindle. The most intriguing free graphic novel is Bananaman ranked at the bottom, #17. The only Kindle devices that can read graphic novels are the Kindle Fire and Kindle for Android. It’s rather lame that the Kindle iPhone app cannot read graphic novels from Amazon. It looks like no Bananaman for me! I will stick to buying my graphic novels from Comixology (that link is an affiliate link that will earn the Challengers Comics, local comic book store in Chicago, a bonus percentage of every sale). If you really want to read Bananaman #1, it’s available for free on the graphic.ly platform (web-only). 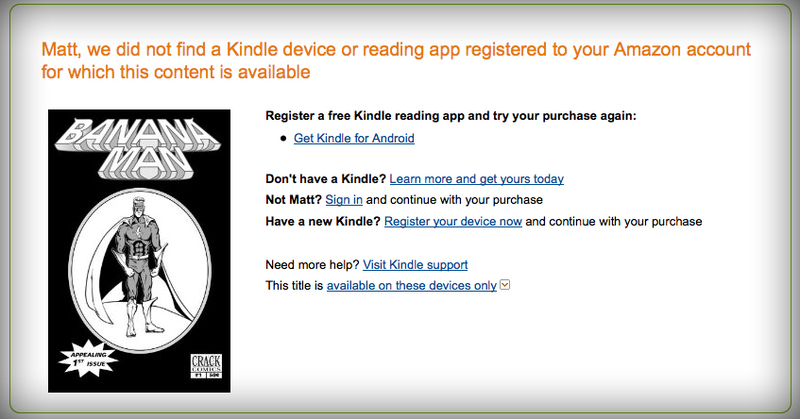 UPDATE: Five days after this post, Amazon released a new Kindle for iPad app that allows comic book reading. My first comic book I bought on the Kindle? Banana Man 2, 3, and 4.